Cut feta cheese into ½ inch cubes. Combine feta cheese cubes, lemon zest, olives and Provencal grapeseed oil in a small bowl. Cover and marinate overnight. 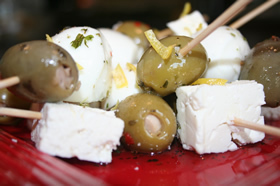 Skewer marinated feta cheese cubes and olives alternatively onto toothpicks. Drizzle with marinade and serve.